SINGAPORE - A former assistant nurse who made inflammatory remarks about Singaporeans on Facebook earlier this year, has pleaded guilty to three charges on Wednesday (Aug 26). Channel NewsAsia reported that Ed Mundsel Bello Ello, a Filipino, was convicted on one count under the Sedition Act, for promoting feelings of ill-will and hostility, and on two counts of providing false information to police. An additional charge under the Sedition Act, and another for lying to police, will be taken into consideration during sentencing. 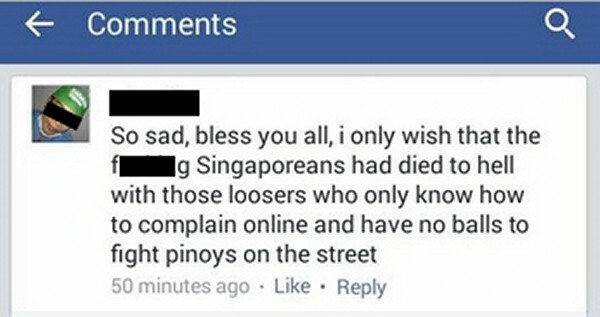 On Jan 2, the 29-year-old called Singaporeans "loosers (sic) in their own country" on his Facebook post. He added: "We take their jobs, their future, their women, and soon, we will evict all SG loosers out of their own country". He also prayed that "disators" (disasters) would strike Singapore and "more Singaporeans will die" and he would celebrate. The post ended with "Pinoy better and stronger than Stinkaporeans". According to The Straits Times, on Jan 4, Ello told a police officer that his Facebook account had been unlawfully accessed by an unknown third party, so that the police would not conduct further investigation into his alleged sedition offence. Although he claimed that his Facebook account has been hacked, earlier insults made online by the Filipino nurse have been uncovered by a sharp-eyed netizen. 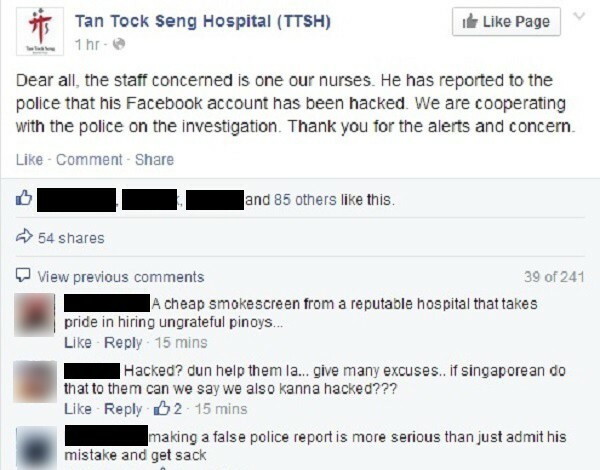 The nurse from Tan Tock Seng Hospital is currently under fire for the inappropriate comments he made in a recent Facebook post which went viral on social media in Singapore. 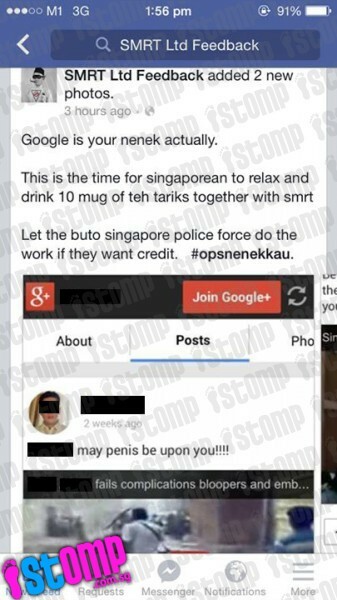 Stomp contributor Ven, sent in screengrabs of comments the nurse made on on several occasions last year on Facebook that were also derogatory. More inappropriate comments were also uncovered on his Facebook and Google Plus accounts. 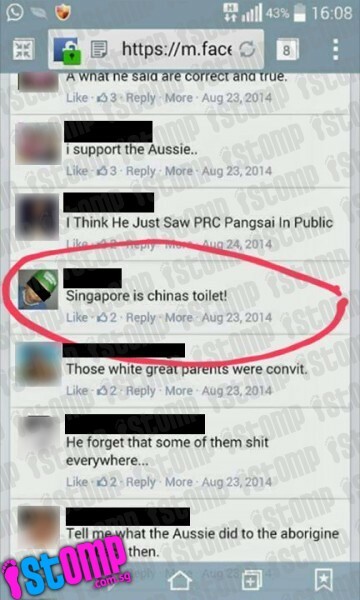 The Stomp contributor said: "Did his facebook account really get hacked?" His online antics came to light when his post went viral on a local public Facebook page, The Kaki News Network. After his post was shared by over 30,000 users, Bello found himself saddled with several police reports against him. Ello then lodged a report with police, claiming that he was "shocked and furious that these comments had been attributed to him". Tan Tock Seng Hospital, where he was employed, subsequently carried out an investigation on his online conduct and fired him over the incident. Although the Filipino had told police on three occasions that he did not post offending remarks on Facebook, he finally confessed in his fourth statement when "he found he could not keep up the lie", Bello's lawyer, Mark Goh, said. Deputy Public Prosecutor Kumaresan Gohulabalan said Ello had been regularly commenting on reports and articles relating to Singapore since the middle of last year in a "vile, derogatory and offensive" nature which which touched on sensitive issues of race and nationality. Ello will be sentenced on Sept 16. The maximum penalty under the Sedition Act is a $5,000 fine and three years' jail. For giving false information to a public servant, he could be jailed for up to one year and/or fined up to $5,000 per charge.